In addition to meandering through the Prudential Center and Copley, I also walked up and down the entire length of Newbury Street. Two new stores are coming soon. The first that I will talk about is a new Ed Hardy Store coming later this month. Can someone who's a little more fashion conscious tell me about Ed Hardy and how it seemingly sprung up from nowhere over the last several months? I'd never heard of it before and then suddenly I walk down the street and I see everyone rocking these incredibly loud and colorful Ed Hardy shirts. The clothing seems pretty cool, too expensive for my wallet though. The store is on the first block of Newbury off of Mass Ave. If I remember correctly, it's next to the North Face Store. Happy shopping to all the college kids who are returning and have access to their parents credit cards. 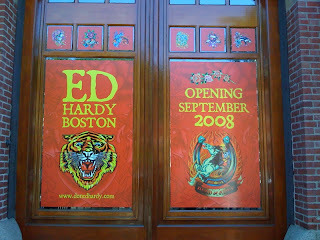 2 Response to "Ed Hardy Store on Newbury Opening Soon"
Christian Audigier designs for Ed Hardy. I'd say it's probably more popular out west (meaning LA), and is catching on more and more out here. ed hardy has been around for at least a few yrs. and it isn't a new phenomenon. my sister (who is crazy into fashion), bought me one for chanukah 4 yrs ago. i'm not a fan of their shirts tho for me. if u watch entourage drama wears them a good amount. they've been popular ever since the stars started wearing them, example: ashton kutcher back when he did that 70's show.